Glaive's critical strikes cleave in a cone in front of him. Glaive rockets in the target direction, damaging all enemies along the way. His next basic attack is replaced by a frightening blast that knocks his target back 5.5 meters. Passive: Increase critical strike chance and AOE cleave damage of basic attacks. Activate: Instantly execute a critical strike. This deals weapon damage and is treated like a basic attack, but can deal bonus crystal damage if you have any crystal power. 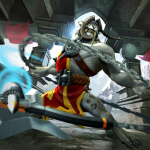 Passive: Glaive will generate Bloodsong stacks from basic attacking or from receiving basic attacks. Each stack grants him bonus lifesteal. Max 20 stacks.Activate: Swings Glaive's axe in a 5.8-meter circle, dealing massive area damage based on number of Bloodsong stacks used. This removes all stacks. The initial design for Glaive came from the idea that there have been several Glaives throughout history, with titles like Bonecrusher, Longtooth, or Far-Tracker. Each one is born with the spirit of his ancestors, and becomes an avatar, taking on Glaive’s form. I wanted to explore the most primitive version of Glaive, the purest essence. 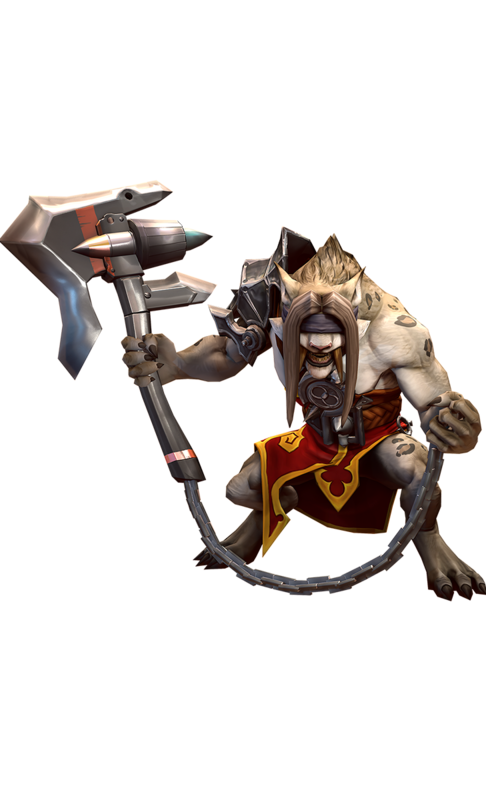 Original Glaive has a jet axe, but the inspiration for him was the axe-wielding barbarian. For this skin, I wanted him to look even more barbaric.